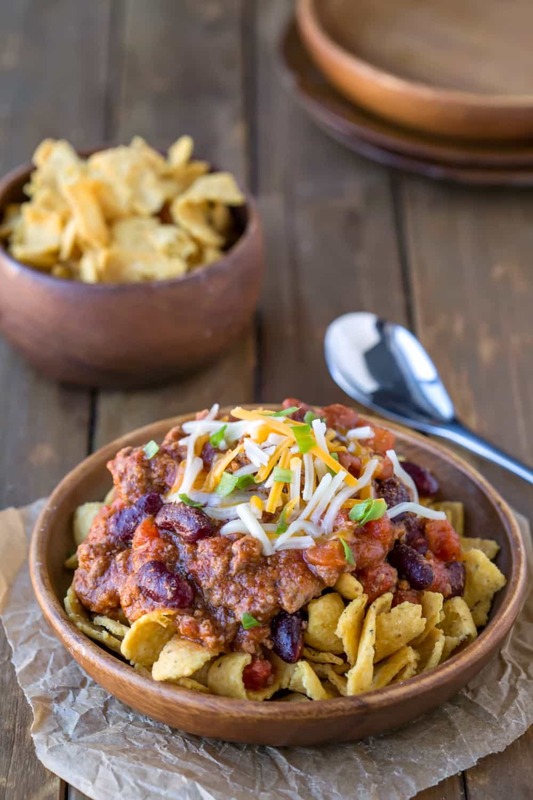 Frito Chili Pie is an easy dinner recipe that can be made in either a crock pot or on the stove top! Sometimes you just need some comfort food. If that food is topped with cheese and chips, so much the better. Since I’m trying to take off my post pregnancy weight, I cut down on the amount of cheese (just enough to dust over the top) and chips (a small handful). The chili was already fairly healthy, and I found that I didn’t miss the extra chips and cheese. If you like to keep the chips crunchier, spoon the chili over the chips because it keeps the chips from getting soggy. I’ve included directions for preparing this in the crock pot or on the stove. 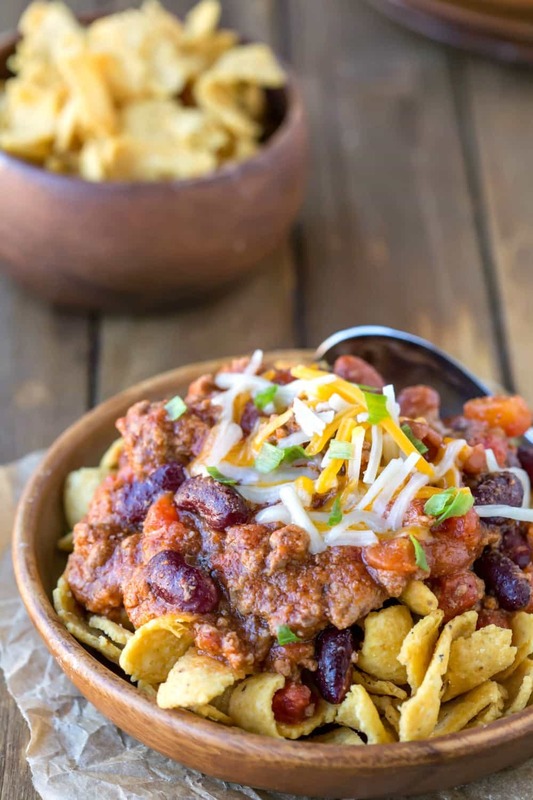 Either way, this Frito Chili Pie is a delicious, easy dinner! Kate/i heart eating is a participant in the Amazon Services LLC Associates Program, an affiliate advertising program designed to provide a means for sites to earn advertising fees by advertising and linking to amazon.com. As an Amazon Associate, she earns from qualifying purchases. This participation does not constitute an endoresement of this site by Amazon. 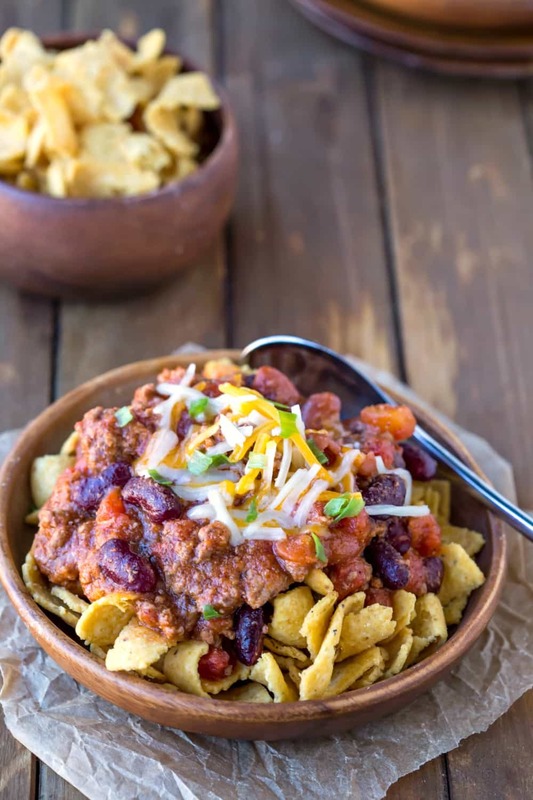 Frito Chili Pie is an easy dinner recipe that can be made either in a crock pot or on the stove top! Brown ground beef in a pot over medium-high heat. Drain ground beef, and add garlic to ground beef. Cook for 1-2 minutes. 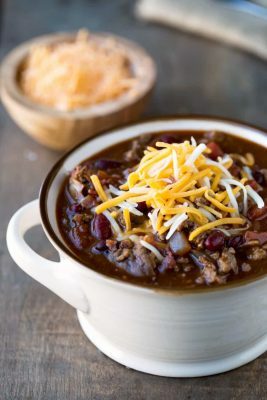 CROCK POT: Add browned ground beef to 5 qt or larger crockpot with tomato sauce, Rotel, salt, oregano, cumin, chili powder, Tabasco, and beans. Stir to combine. Cover and cook on low for 6-8 hours or high for 3-4 hours before serving stir. Add in cornmeal and water, if necessary. Cover, and cook an additional 30-60 minutes. STOVE TOP: Add tomato sauce, Rotel, salt, oregano, cumin, chili powder, Tabasco, and beans to the browned ground beef. Stir to combine. Cover and let simmer, stirring occasionally, for at least 1 hour. Mix corn meal with water, and then add to the chili. Stir to combine and simmer for an additional 10 to 15 minutes. 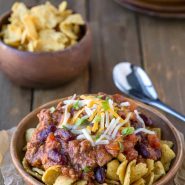 I like to top my chili with the Fritos so that they stay crunchy, but you can top Fritos with chili. Add any other desired toppings, and enjoy! *Cook time is for stove top preparation. When I was in school (a long time ago) you had the option of the cafeteria or the snack bar. I choose the snack bar and ordered a Frito chili pie. It was a (then a 5 cent bag) opened on the side with canned chili, onions if you wanted them and covered with grated cheese. You ate it out of the bag with a plastic spoon. I think it cost 15 or 20 cents. Hello! 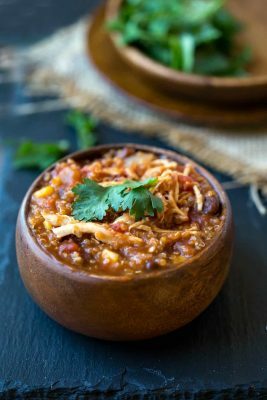 This is one of my favorite meals except I usually open a can of chili! LOL! I want to try and make this because it sounds delicious. I do have a question though. When you say “cornmeal” do you mean cornstarch or cornflour? 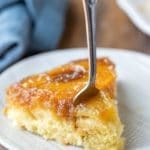 To me cornmeal is yellow and used to make cornbread. I’m a little confused. Is it to thicken the chili? Thank you for your help! you give directions for the corn meal and water after the section about making it in a skillet. I am a very novice cook. There is no direction on when the corn meal and water should be added when cooking in croc pot. I am going to take a gamble and do it when all other items are added. Will update if this was correct or not. Sorry about that! I add it toward the end, and then I cook it for another 30-60 minutes. Although they hold up well in crispness, I find the Frito’s are way too salty. You can certainly leave them off and just eat the chili without them. Can I cut back or omit the Tabasco sauce? I do not like a lot of heat in my food. Sure! You can cut it back or omit it. Thanks I think I will try it soon. Looks really good. I do not know what Ro-tel is – can you please advise and if i cannot get this any suggestions as to what i can use in replacement? Thanks – the recipe sounds like one i would like to try but not sure of that ingredient. Ro-tel is a national brand of canned tomatoes with green chiles. You can use any brand of canned diced tomatoes with green chiles as a substitute. If you have any other questions, please let me know! I’ve never measured it out, but it makes a fair amount. I’m sorry that I can’t give you an exact measurement. Thank you for catching that! You can add the cornmeal in the hour of cooking (on low), and you won’t need to add the water with it. 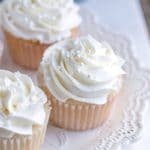 If you find that the cornmeal makes it thicker than you’d like, you can always add in a little extra water at that point. you stated add cornmeal with no water in the one hour of cooking on low in crockpot ( I assume last hour). if cooking on high would you still add cornmeal same way or if not when would add it. thanks! 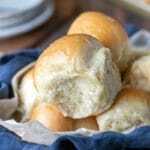 Usually, on high it cuts the cooking time in half, but I haven’t tried it with the cornmeal. I would guess that you could add it during the last 30-40 minutes, though. G’day! used to love Fritos, true! Your photo brought me back to childhood today too!